Last night my husband and I went to our local nursery just to browse, suffice to say, we came home with 10 more plants that we really didn't have room for. I found space for 7 of them, but as for the last 3, it just wasn't happening. All of my pots were already stuffed to the gills! I rooted through my shed to see if I could find any rogue pots hiding amongst the golf clubs and shovels, but there was nothing left. I had somehow managed to fill every pot we own. 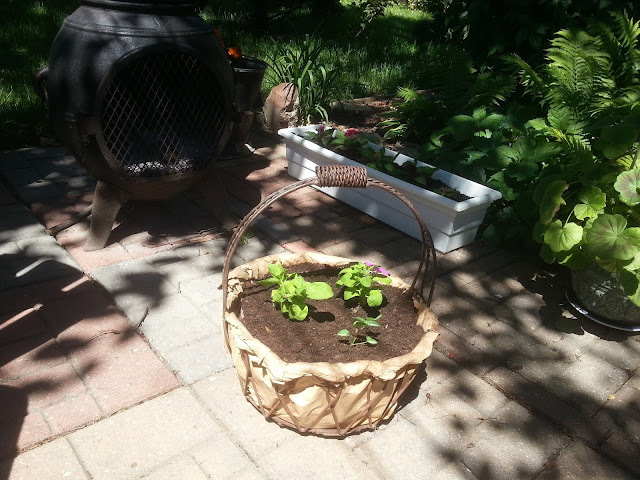 I did, however, have a wrought iron basket. 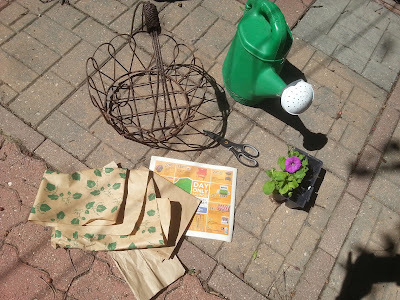 I'd seen the magazine pictures and blog posts of lovely hanging baskets with burlap or coconut fiber liners, spilling over with lush petunias and other beautiful gems. I didn't have any coconut fiber or burlap. I wracked my brain, what did I have on hand that I could use instead? Leaves, no. Old bed sheets, no. Newspapers, maybe, but they're not very pretty. Brown paper, yes! Ding, ding, ding! The lightbulb lit up and I was off like a herd of turtles! I gathered my supplies and got to work! Here is a list of the materials you will need to complete this project. Tear open up your paper bags so you can lay them out flat in one layer. 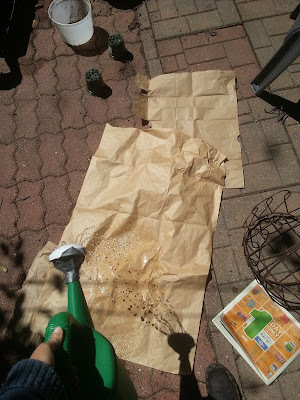 Saturate your brown paper with water. Press your brown paper into your basket. Be firm but gentle as you do not want to tear it, but at the same time, you want to get the paper laid evenly into all of the nooks and crannies. Add several layers of damp brown paper until the interior of the basket is well covered. Trim off the excess brown paper from the rim, but make sure to leave 2 inches or so to roll over the rim. Gently roll the excess brown paper over the rim, be careful not to tear it. Unfold your newspapers and lay them flat on the ground. Saturate the newspapers with water. 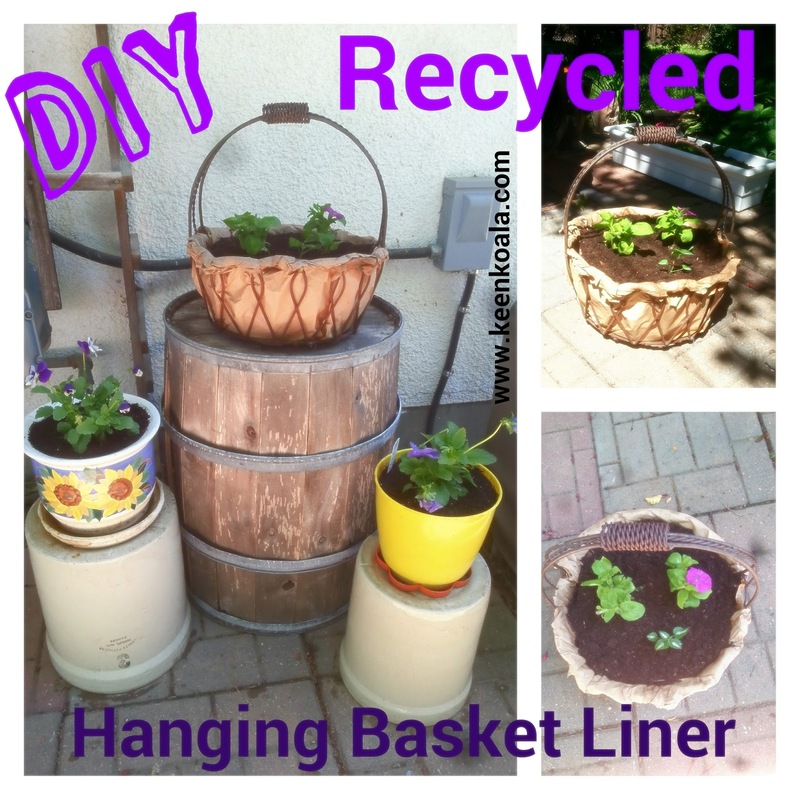 Layer the newspapers into your basket. 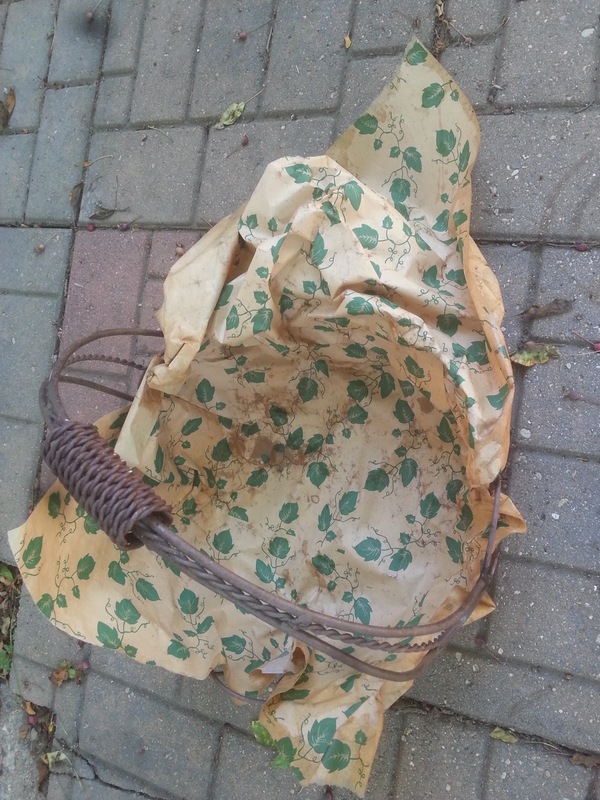 Make sure to keep the newspapers below 1 inch from the top of your basket, as these are to be hidden once filled with soil. Using your scissors, gently make a hole in the bottom of your basket. Pierce through the newspapers and the brown paper. Widen the hole slightly with your finger. Cut a small hole, the size of a quarter in the bottom of your grocery bag. 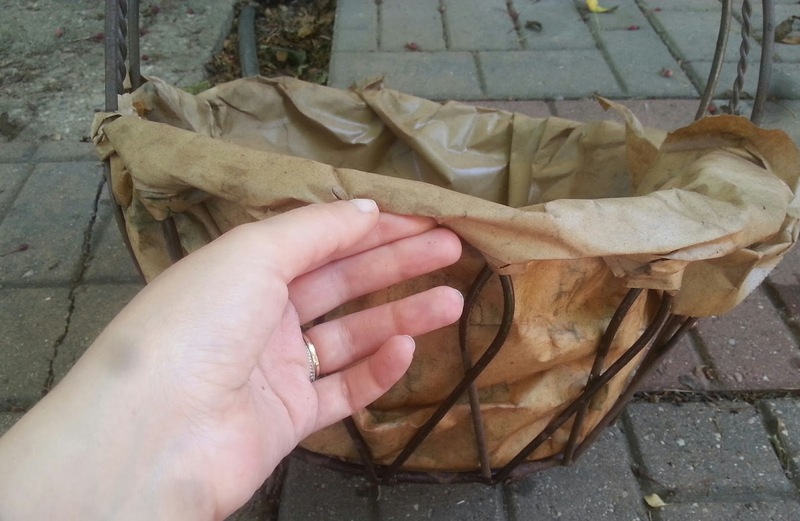 Insert this part of the grocery bag through the hole in your basket. 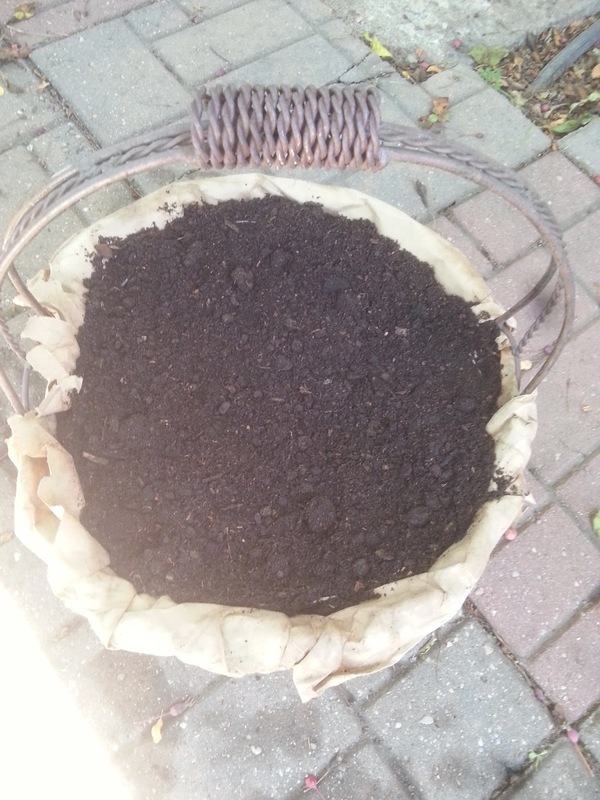 Open the bag and flatten it along the bottom and sides of the basket. 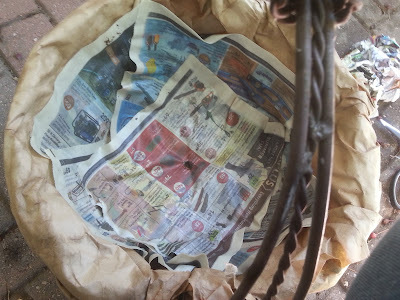 Use your finger to make sure that the hole is open and you can see through the bag and newspapers This hole needs to be open as it is the drainage hole for excess water. Place a small stone over the hole. 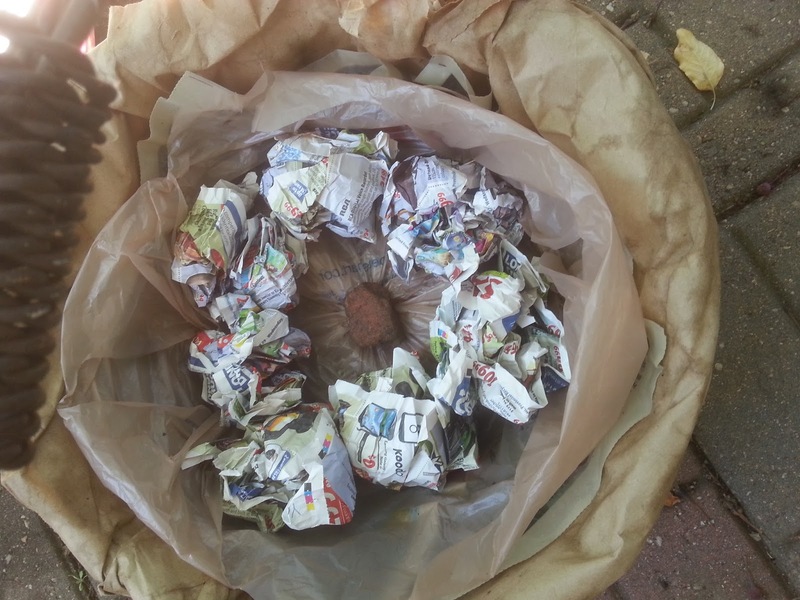 Take 5 smaller sheets of dry newspaper and crumple them into balls. Arrange them inside of the plastic bag in the basket, around the stone. These newspaper balls have 2 uses, they are filler so that you can use less soil and make basket will be less heavy, and also they work well for holding onto moisture. 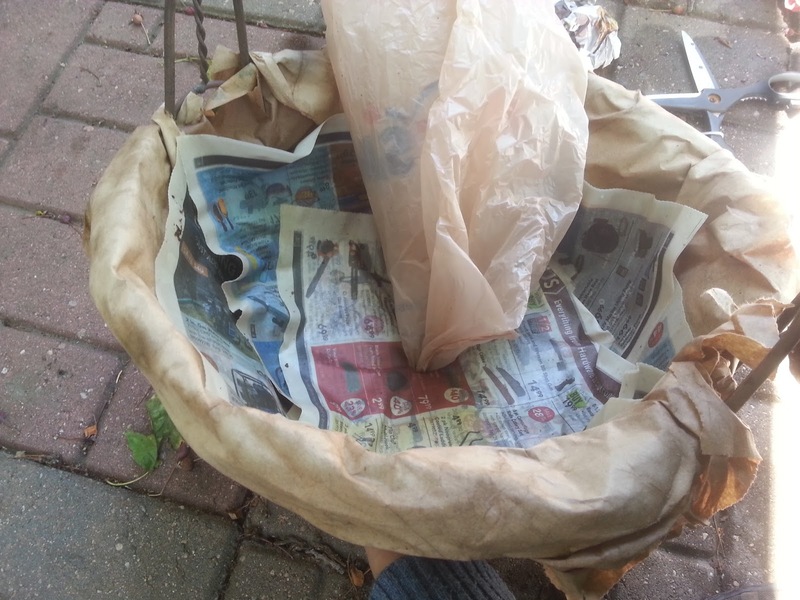 Pour in your potting soil to a level high enough that it conceals both the plastic bag and the newspapers. Add your plants and then water gently. 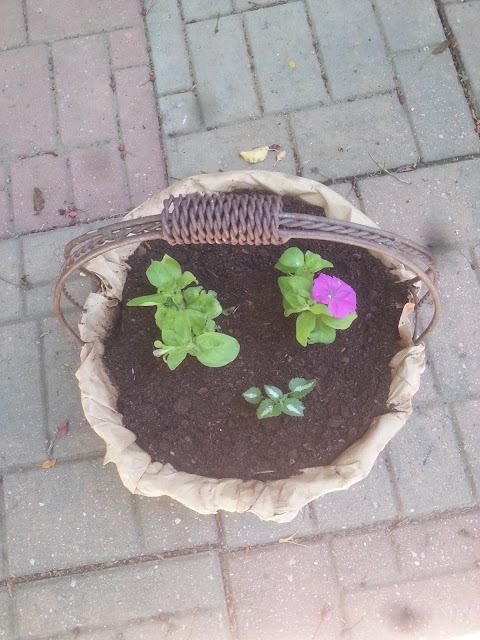 I planted 2 purple petunias and some Lamium. Give them a little drink, but do not overwater. And there you have it. Stand back and be amazed at the simple beauty of your amazing hanging basket! Who knew that recycled paper could ever look this good? 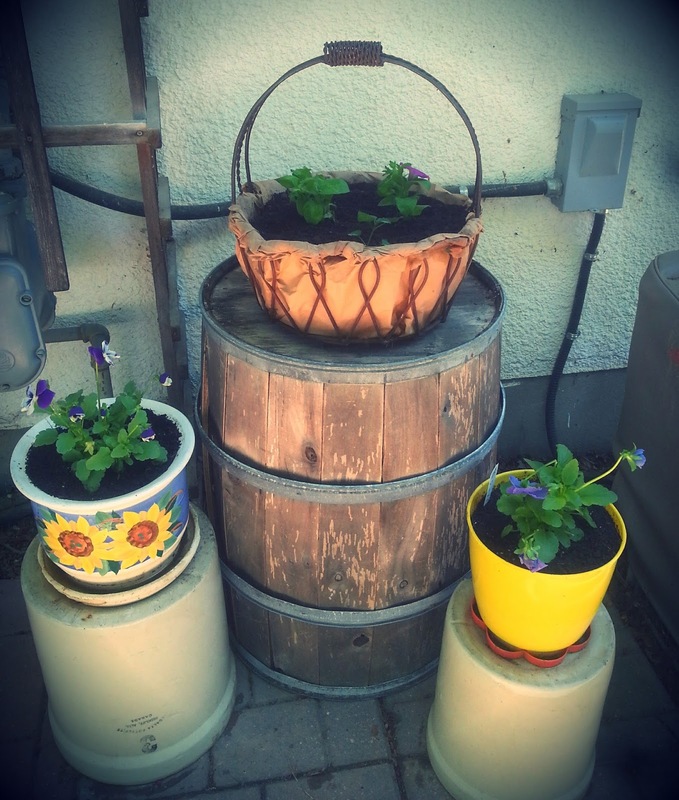 Doesn't this look simply divine sitting atop my old whiskey barrel surrounded by a couple of vintage crocks? So rustic and bursting with country charm! Did you enjoy this tutorial? Are you going to give it a try? What do you use to line your hanging baskets? Let me know, I would love to hear from you.